WASHINGTON (AP) — Uber’s CEO quit President Donald Trump’s business council. Nordstrom stopped selling Ivanka Trump’s fashion. Boeing, Lockheed Martin and Toyota, meanwhile, suffered through the discomfort of being on the receiving end of Trump Twitter tirades. The Trump era is a perilous new landscape for corporate America. Companies are feeling political pressure like never before, squeezed on one side by consumers who are boycotting products with any ties to the administration and on the other by the outspoken, social media-loving president. For most companies, the decision to get political used to be made after long, careful deliberations among a company’s leader, public relations team, lawyers and lobbyists. Now, in an increasingly divided America, companies may have no choice but to move quickly. The predicament for companies was on display ahead of Trump’s first White House meeting Friday with his business forum, a group that includes General Motors CEO Mary Barra, JP Morgan CEO Jamie Dimon and a dozen others. The night before, Uber’s Travis Kalanick told his employees he’d decided to quit the council because his presence on it was being “misinterpreted” as an endorsement of the president. 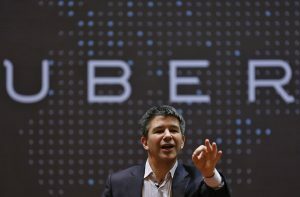 “I spent a lot of time thinking about this and mapping it to our values,” Kalanick told employees in an internal memo obtained by The Associated Press. Disney CEO Bob Iger didn’t attend either; instead he was at a company board meeting in California. A seat on a high-profile White House council, no matter the political party in power, has previously been a can’t-pass-up sign of prestige. It’s a direct way for a company to express opinions to the president – far less fraught than trying to gain access through lobbying or donating money. Trump said he intends to take advice from the council, which he said would meet regularly to discuss policies. Trump said he’d be seeking guidance on his plans to roll back the financial services legislation known as the Dodd-Frank bill from JP Morgan’s Dimon. “There’s nobody better to tell me about Dodd-Frank than Jamie,” he said Friday. But an audience with this president, at least at this stage, brings with it customer complications. No doubt weighing into Kalanick’s decision to give up that influence was the boycott the ride-sharing company, popular in urban, largely Democratic areas, had been experiencing all week. That campaign went viral on social media Saturday night when people perceived Uber as trying to break a taxi strike to and from New York’s John F. Kennedy Airport that was in response to Trump’s executive order suspending the country’s refugee program. It didn’t let up even after Uber publicly condemned Trump’s executive order and contributed to relief groups. Grab Your Wallet claimed another victory Thursday night when Nordstrom announced it had stopped selling first daughter Ivanka Trump’s fashion line. The company cited the brand’s performance. The department store was one of Grab Your Wallet’s first targets. Neiman Marcus also appears to have stopped selling her jewelry. “Companies have been late to the game with realizing how much ire it can create to associate with a person like Donald,” Coulter said. While the anti-Trump boycotters cheered Nordstrom, angry Trump supporters deluged the company with angry messages on Twitter – some saying they were now prepared to begin their own boycott. Maine-based retailer L.L. Bean faced the flip side of that. Linda Bean, one of many family members involved in the company, gave money to a pro-Trump super PAC during the campaign, prompting Grab Your Wallet to call for a boycott, which in turn prompted Trump to weigh in with a bit of social-media marketing. “Thank you to Linda Bean of L.L. Bean for your great support and courage. People will support you even more now. Buy L.L. Bean,” Trump tweeted last month, a few weeks before taking office. When they make a move that could be perceived as a knock on the president, companies like Nordstrom must calculate not only the financial impact of angering Trump supporters but also the possibility that Trump himself could take notice – spiraling the crisis to another level. Robert Passikoff, president of Brand Keys Inc., said CEOs are especially vulnerable now because technology allows people to protest and vent their anger without organizing a march, or even leaving their home. Among those who can weigh in with a few finger taps: the leader of the free world. “The direct communication from the president of the United States, with attacks on specific brands and specific people, is not something we’ve ever seen before,” he said. Just how much this new, perilous environment for CEOs will actually affect business in the long term is difficult to know. Shares of Lockheed fell sharply after the president tweeted in December that the cost of its F-35 fighter jets was “out of control,” then fell again after he complained about the military contractor at a news conference the next month. The stock quickly recovered both times. Associated Press writers Bernard Condon in New York and Jill Colvin in Washington contributed to this report.